Summary: How much does it cost to build a house in Tennessee and finish the basement? How do you add a basement entrance door? Because so many people want to know the cost of a finishing a basement, I am including that as an option in this cost to build a house example. You will be amazed at how much the cost per square foot of the entire house drops when you add the basement area! 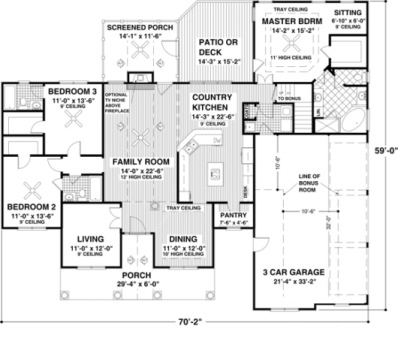 Here is an attractive home from America’s Best House Plans. 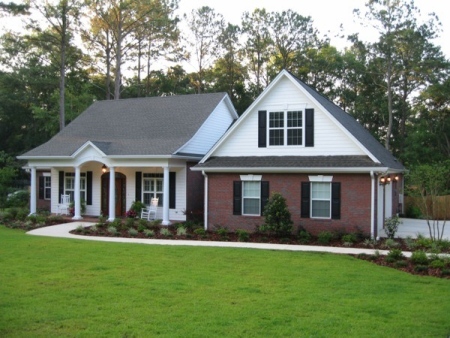 Round columns dress up the front porch on this 3 bedroom, 3 bathroom southern country house. Classic styling makes it perfect for almost any neighborhood. The large vaulted family room, enormous country kitchen and its 452 square foot bonus area make this home feel so much more spacious than one might expect of a 2097 square foot design. The master suite includes a double tray ceiling, a sitting area, a large walk-in closet, and luxurious bath. The 14’-3” x 22’-6” country kitchen is open to the vaulted family room. A French door leads to the vaulted screened porch. The patio or deck is accessible from both the screened porch and master bedroom. The dining room is adorned with a decorative round column and tray ceiling. Bedrooms two and three each feature walk-in closets and individual baths. Heated Area: 2,097 sq. ft. Unfinished Basement (Foundation): 2,097 sq. ft.
Front Porch: 175 sq. ft. Enclosed Screened Porch: 161 sq. ft. Unfinished Bonus Room: 452 sq. ft.
To estimate cost I’ll use the cost estimating software found on my Getting Started page. I used “Average Standard Quality” (Class #5) for the estimating process along with the choice for an unfinished basement foundation. Using this “shape” on the Cost to Build Calculator for the Nashville, TN area, I came up with $334,453 using a General Contractor (home builder). For an owner/builder I deducted the General Contractor markup of $38,183 for a total of $296,627. That’s an approximate cost of $159 per sq. ft. with a builder, and $141 for an owner/builder. Changing the software input to a “finished basement” the finished square footage increased to 4,194 sq. ft. (2,097 + 2,097), and the total building cost rose to $351, 408. The cost to build per sq. ft. dropped to $83 per sq. ft. when using a General Contractor. Deducting $40,118 for the cost of a General Contractor lowers the cost to build to $311,290, or $74 per sq. ft. for an owner/builder!! 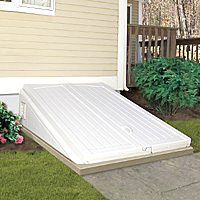 If the basement is on flat land, you will need at least one Emergency Basement Door. Note: The cost of Emergency Basement Doors is not included in this cost to build example. 2 porches…porches are not cheap. Large unfinished bonus room above the garage. Multiple roof lines and foundation corners. Steep roof pitches which add roofing cost. It is however, a very attractive house, and with a finished basement, a lot of space for the “buck”. Important Notice: Cost estimates change with time. YOU can check to see if and how much this cost estimate has changed by running the Craftsman Book Co. free cost estimating software yourself. Keep in mind that this 2018 estimate is approximate and is just a guide. Until you actually start getting your own bids and estimates and entering them into your own spreadsheet (see my spreadsheet page for FREE spreadsheets, it will remain approximate.